The addition of a deck into a landscape brings a distinctive opportunity to a design. A deck easily becomes an indoor/ outdoor space with its ability to be at the same floor elevation as the inside of the residence. 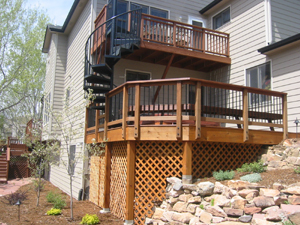 Decks bring unique materials such as wood, composite, wrought iron, etc. into the landscape. Often the materials are repeated from existing elements of the residence which helps to visually connect the landscape to the home. Loretta designs decks to fit with the home in form, function and build ability. Detailed deck building plans by Kevin Foss of Osmosis Architecture. Pergolas always add the feeling of an outdoor room and are a great way to accentuate the sense of an indoor/ outdoor space. 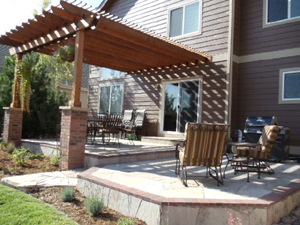 Their overhead structure is a great way to create shade on a sunny patio area and offer a location to install an overhead fan and light. Pergolas often are extensions of the residence but they may be free standing in a more remote part of the landscape and viewed from inside of the home. Loretta designs pergolas to fit with the home in form, function and build ability. Detailed pergola building plans by Kevin Foss of Osmosis Architecture.